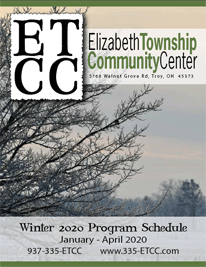 - our own Elizabeth Township. Elizabeth Township was the original name given to one of Montgomery County's four townships, the others being Dayton, German, and Washington. Organized in 1803, Montgomery County's Elizabeth Township comprised all of the area north of Dayton Township to the Michigan border and west to the Indiana border. When Miami County was first formed on March 1, 1807, it was divided into two townships. Named after Montgomery County's old Elizabeth Township, Miami County's Elizabeth Township included all of Miami County east of the Miami River. The township was soon parceled off and on July 21, 1807, the Elizabeth Township we know today was officially recognized as Miami County's fourth township, though it is the only township in Miami County to retain its original name. The township area is 19,125 acres or about 29.9 square miles.